News of what's going on in radical politics in Scotland. The paper argues that increasingly obsolete sea transportation facilities and links (docks, ports, shipping services) in Scotland mean existing international trade flows are weak and are becoming ever weaker as the Scottish economy continues to lose competitiveness. Indeed, much of Scotland’s traded goods have to be sent to and from ports in England, raising costs. The effect is that the amount of trade going through Scotland’s container ports is the same as that going though Iceland’s Reykjavik container port (when Iceland’s population is just 329,000). The obsolescence results from chronic lack of investment over decades by private equity port owners in new technologies, infrastructure and facilities as well as from the privatisation of the port authority role. On this basis the paper contends that as ports in Scotland are a devolved responsibility, there is nothing to stop the Scottish Government formulating its own ‘ports policy’, preferably as part of a wider maritime transport and trade policy. Such a policy should seek to estimate the port capacity that is needed in future, and to then provide that capacity to enable trade to expand and thereby ensure the economy can grow, and to plan and facilitate ongoing investment in essential port infrastructure and key international shipping connections. Moreover, the Scottish Government should also seek to return the statutory regulatory ‘port authority’ roles and functions which are currently held by offshore private equity firms, to the control of public agencies, as is the case in virtually all other countries. But critical in formulating its own ‘ports policy’, the Scottish Government thus needs to take control of the situation, not by taking existing obsolete ports into public ownership but by developing entirely new port capacity at more optimal locations. The paper argues this can be done by offering concessions to private firms to build and operate required ports and terminals as well as by an enforcement regime requiring port owners to adequately maintain and improve existing facilities, and to better regulate port charges. Alf Baird commented: ‘No economy can sensibly depend on the offshore private equity model of port ownership and regulation to bring about trade growth. By its very nature, the private equity model limits investment in new port infrastructure, whilst continually demanding excessive profits, followed by selling on of what are ‘mature’ port assets to another ‘fund’ to do precisely the same thing over again. Ultimately, there comes a time when the nation’s port assets are so obsolete and trade is so diminished that this model is completely unstuck; given Scotland’s moribund trade position that time seems ever closer’. Alf Baird began his working career in 1974 as a Liner Shipping Clerk at the port of Leith, then running a small packaging and freight forwarding company. After a degree in Business Studies at Napier University in Edinburgh in 1993, he was employed there first as a researcher and then as lecturer, completing a PhD on strategic management in the global container shipping industry in 1999. He was appointed Director of the Maritime Research Group at Napier in 1997, and in 2005 was appointed Professor of Maritime Transport. He has been appointed as specialist advisor on maritime transport matters by a number of select committees of Parliaments in the UK, Northern Ireland and the Isle of Man, and as advisor to various government agencies and ports including Scottish Enterprise, Highlands & Islands Enterprise, Clydeport, and Orkney Islands Council. He left Edinburgh Napier University in 2015 although he remains actively involved in international research and consultancy activity, particularly in the maritime economics/policy/business areas, and with emphasis on ferry transport, container shipping, cruise shipping, and seaport policy and design. In a carefully constructed but sharply critical assessment of the recent Institute of Fiscal Studies (IFS) report entitled, ‘Adjusting Scotland’s Block Grant for Tax and welfare Powers; Assessing the Options’, leading independent economist, Jim Cuthbert, warns any negotiations deploying the assumptions and reasoning of the IFS report will ‘do Scotland gravely down’, and present a further twist to the present ‘fiscal trap’. In the first of a new series of Jimmy Reid Foundation working papers entitled ‘IFS report provides inadequate basis for Scottish fiscal settlement negotiations’, Cuthbert demonstrates the IFS report by Messrs Bell, Eiser and Phillips represents ‘a very flawed assessment of the options for adjusting the Scottish government block grant and a significant danger for Scotland of falling into a ‘fiscal trap’ if the current negotiations take the IFS report seriously’. The danger of being misled by the IFS report is significant because, while it does not recommend any specific method for adjusting the block grant and correctly identifies the difficulty of implementing the ‘no-detriment’ principles set down by Smith, the report nevertheless makes a series of incorrect decisions and assumptions about the characteristics of the block grant adjustment process. One example is the report’s decision to use the method based on tax revenue indexation for adjusting the abatement to the block grant. This has profound implications for the types of risk to which the Scottish government’s revenues would be exposed, and for the way in which Smith’s second no-detriment principle will impact on the freedom of action of the Scottish government. The upshot is that, if the IFS report is used as a basis by which to negotiate the fiscal settlement, the decision to index on revenue, rather than tax base or some other approach, means that the Scottish government effectively loses control of its own full discretion over the income tax rates it wishes to set. What effect does the Scottish government’s lack of economic powers have in affecting the balance between risk and potential reward in the eventual fiscal settlement. What are the limitations, and risks, of trying to run a monetary union on the basis of a largely formulaic approach to distributing resources. Cuthbert’s conclusion is ‘the IFS study in effect represents a distorted assessment of the options for the post-Smith fiscal settlement. There are therefore grave dangers for Scotland if the IFS report were taken as the basis on which the fiscal settlement negotiations are conducted’. The Reid Foundation has submitted its response to the ‘Lobbying (Scotland) Bill and has concluded that the proposed register of lobbyists is insufficient. Given that the Scottish Parliament was designed to be open, accessible and accountable, there is a need for increased transparency in lobbying activity and that includes extending freedom of information rights to increase the power of people to hold MPs and Ministers to account. Worker’s Rights are Human Rights! The Rt. Hon. Nicola Sturgeon MSP, First Minister of Scotland, delivered the Third Annual Jimmy Reid Memorial Lecture “WORKERS’ RIGHTS ARE HUMAN RIGHTS” on Tuesday 24th November in the Bute Hall, University of Glasgow. The 1,000 strong audience included members of Jimmy Reid’s family, along with veterans of the UCS dispute. The Lecture took place against a backdrop of engineered uncertainty on the status of trade unions and fundamental human rights in the UK: the Trade Union Bill is currently being debated at the UK parliament and its provisions seek to weaken the ability of trade unions to represent their members; the UK government wants to change the mechanism to define and protect human rights and is about to publish proposals to abolish the Human Rights Act and introduce a Bill of Rights. These developments are opposed by the Scottish Parliament. The meeting was chaired by Grahame Smith, General Secretary of the STUC. The Lecture honours workers’ leader Jimmy Reid, who delivered his inaugural address as rector of Glasgow University in the Bute Hall on 28th April 1972. Jimmy delivered his famous “The rat race is for rats” speech. His archives and those of the UCS Work-in are maintained by the University and some were on display prior to the Lecture. ‘We welcome the First Minister’s criticism of the Trade Union Bill and the actions she proposes the Scottish Government will take to blunt its impact when it becomes law. However, and notwithstanding employment issues remain reserved matters, we urge the First Minister and the Scottish Government to go further by using their existing powers to provide regulatory underpinning to worker participation so that workers have influence over the way their workplaces are run. This could be done through public procurement and in the public sector. The Rt. Hon. Nicola Sturgeon MSP, First Minister of Scotland, will deliver the Third Annual Jimmy Reid Memorial Lecture “WORKERS’ RIGHTS ARE HUMAN RIGHTS” on Tuesday 24th November at 6.30pm in the Bute Hall of University of Glasgow. All the tickets have been taken up and the 1,000 strong audience will include members of Jimmy Reid’s family, along with veterans of the UCS dispute. The Lecture takes place against a backdrop of engineered uncertainty on the status of trade unions and fundamental human rights in the UK: the Trade Union Bill is currently being debated at the UK parliament and its provisions seek to weaken the ability of trade unions to represent their members; the UK government wants to change the mechanism to define and protect human rights and is about to publish proposals to abolish the Human Rights Act and introduce a Bill of Rights. These developments are opposed by the Scottish Parliament. The meeting will be chaired by Grahame Smith, General Secretary of the STUC. The First Minister and guests will be welcomed by the Principal and Vice-Chancellor, Professor Anton Muscatelli. Following the speech, there will be a question and answer session. Our Director, Professor Gregor Gall, will make a short contribution on our work programme to conclude the event. The Lecture honours workers’ leader Jimmy Reid, who delivered his inaugural address as rector of Glasgow University in the Bute Hall on 28th April 1972. Jimmy delivered his famous “The rat race is for rats” speech and a souvenir programme will be available containing the text. His archives and those of the UCS Work-in are maintained by the University and some will be on display prior to the Lecture. “When Jimmy Reid spoke here in April 1972, it was towards the end of the Upper Clyde Shipworkers dispute. The work-in which Reid helped to organise was arguably the greatest achievement of the post war union movement. It asserted the fundamental right of individuals to work. It did so through a peaceful, positive protest which captured the imagination of people around the world. 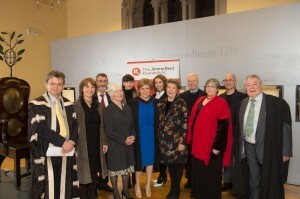 “The address by the First Minister to the annual Jimmy Reid Memorial Lecture could not be more timely. The values expressed by Jimmy in his famous address espoused the importance of solidarity and basic values of decency which trade unions uphold on a daily basis. “The Trade Union bill strikes at the very heart of democracy, at both the democratic right to assembly and representation in the workplace and at the devolution settlement itself. The Bill is an attack upon on human rights and a completely unwarranted interference in the right of government in Scotland, at all levels, to conduct industrial relations as best suits their vision of workplace democracy. Due to the level of interest, the STUC has arranged an overflow meeting at its centre in Woodlands Road in Glasgow and the lecture will now be streamed by Glasgow University so that people, everywhere, can watch the lecture live. So far we know that people in Switzerland, Germany and North America will be tuning in as well as in Stirling and Inverness. The Reid Foundation is grateful to the University of Glasgow for its assistance in organising the Lecture. As part of its campaign against the Trade Union Bill, the STUC is organising an event on 24th November at 6.30pm which will livestream the First Minister’s Lecture ‘Worker’s Rights are Human Rights’ followed by a Panel Discussion. The venue is the STUC, 333 Woodlands Road, Glasgow G3 6NG. The 3rd Annual Jimmy Reid Memorial Lecture “WORKERS’ RIGHTS ARE HUMAN RIGHTS” will be delivered by Rt. Hon. Nicola Sturgeon MSP, First Minister of Scotland. The meeting will be chaired by Grahame Smith, General Secretary of the STUC. Free entry is by ticket only. In honour of workers’ leader Jimmy Reid, Nicola Sturgeon will address the issue of why workers’ rights are human rights and how this can be used in defence against the Tory Government’s attacks on workers’ economic, political and social rights in Scotland. The First Minister and guests will be welcomed by the Principal and Vice-Chancellor, Professor Anton Muscatelli. Following the speech, there will be a question and answer session. Our Director; Professor Gregor Gall will make a short contribution on our work programme to conclude the event. The Foundation has just published a policy paper on this issue, available at our website. Jimmy Reid was installed as elected Rector of the University in the Bute Hall in 1972, where he made his famous “The rat race is for rats” speech. A souvenir programme will be available containing the speech. His archives and those of the UCS Work-in are maintained by the University and some will be on display prior to the Lecture. We are grateful to the University for their assistance in organising the Lecture. The Jimmy Reid Foundation today publishes a major new critique of government handling of the Scottish economy in terms of the critical component of trade and development. Written by renown independent economist/statistician, Margaret Cuthbert and entitled ‘Growing the Scottish Economy: is Scotland well served on international trade and development?’, the paper casts grave doubt upon the Scottish Government’s ability to increase competitiveness and tackle inequality when the data needed to assess how well the Scottish economy is performing in trade and development is so woefully incomplete and inaccurate. There has been a fundamental failure of the UK and Scottish governments in the collection, collation, and analysis of trade statistics for Scotland. Existing data on trade and development is unjustifiably time-lagged, does not cover all sectors, is sketchy on sectors that are covered, and is based upon low return rates from respondents. It is difficult to have much confidence in the data. Yet the agencies like Scottish Enterprise and Scottish Development International present themselves as providing excellent value for money in gather this poor quality data. Without a timely good quality data on how well Scotland is performing on trade; without an analysis of trends; and without connections being made between trade patterns and trends in the economy, it is difficult, if not impossible, to see how any government can devise, monitor, and evaluate the trade part of an economic strategy. With further devolution under the Smith Commission, these matters will only become more pressing as the Scottish Government becomes more responsible for managing Scotland’s economy. Recommendations for change are made including the way data is gathered and when. .Margaret Cuthbert commented: ‘Without good data, economic strategies can end up as ‘wish lists’ and can actually harm the economy. The effect of past strategies in Scotland cannot be adequately scrutinised to determine whether or why they were successful and cost efficient, or why they failed. We fool ourselves about our economic strategy without knowledge based upon analysis of the facts’. She continued, saying ‘My conclusion is that unless there is a radical change in attitude, in systems, and in working methods by government and government agencies, Scotland will be seriously hampered in improving trade performance, and in particular, in trade helping to make substantive inroads into austerity and into improving economic growth’. In this latest policy paper Carole Ewart urges us to use international human rights standards to create a fairer Scotland. Human rights have not realised their potential to protect individual rights e.g. respect for family life and collective rights e.g. to belong to a trade union. Successive governments, or part of them, have marginalised human rights which means that public support for human rights is worryingly low. Civil society, in particular unions, have an important role to play in reversing this view by identifying the relevance of human rights to workers’ everyday lives and acknowledging their importance in delivering a fair Scotland and UK. For example using human rights arguments in the public procurement process. The UK Government seems to be adopting an anti-human rights position in respect of trade union rights eg voting thresholds and abolishing ‘check off’. The Scottish Government, which must to apply the HRA can be more proactive with legislation and subordinate legislation, guidance etc. to actively support human rights across devolved functions. Upholding our human rights, contradicts the free market economic philosophy of the UK government. However our Government has inherited an undertaking to the UN, that it will ‘progressively deliver’ to the ‘maximum extent of available resources’ defined economic and social rights eg the right to an adequate standard of living. Human rights compliance should, therefore, be central to the economic strategy which businesses operate in, underpinned by a philosophy that respecting rights equates with business success. The UN’s framework on business and human rights allows our government’s economic strategy to fit a globally recognised model. For ‘rights holders’, there is a lot of catching up to do in terms of building the knowledge base and skill application. For example by changing the terminology from an “ask” to an assertion of specific rights to the duty bearer eg a local authority or health board. And an understanding by the duty bearer that they must act and if not there is a reasonable expectation that the human right will be enforced. We need to be more astute in linking human rights with policy and legislative opportunities, eg in the forthcoming social justice consultation, the Community Empowerment Act 2015 and its implementation. Civil society and trade unions should build the knowledge and skills of workers and empower them to assert and enforce their human rights. Consideration should be given as to what can be achieved within the devolved settlement to expand human rights to include worker’s rights as defined in the UN International Covenant on Economic, Social and Cultural Rights (ICESCR). This could begin immediately, include new powers via the Scotland Bill and target manifestos for the Holyrood elections in May 2016. Unions should offer evidence to the UN on the application of ICESCR in the UK, during the formal Hearing process 2015 – 2016, on how workers do not equally enjoy economic and social rights which results in measurable disadvantage to them and their families. Poverty is a menace which needs to be addressed by structural reforms in our economy and there is an opportunity to deliver that change by contributing to the Scottish Government’s baseline research on ‘business and human rights’. A child witness project in Canada evaluated its service after ten years. Respondents, by this time adults, were asked which part of the service had the biggest impact and one replied the worker handing her a tissue when she was crying in the witness box. Until the system was reformed to be human rights compliant for both victims and the accused such behaviour would have been interpreted as coaching the witness and, therefore, forbidden. Enabling the child to have dignity and respect when giving evidence against her abuser, who had violated her human rights, was crucial to the successful delivery of the service. This good news story about the impact of human rights contrasts with its sustained demonization by politicians and some media, portrayed as friend only to the prisoner, terrorist and generally undeserving. That strategy contradicts international law which states that human rights are to be equally enjoyed and entitle each of us to basic economic, social, cultural, civil, political and environmental rights from which we realise our dignity as individuals. The right to a decent standard of living, the right to social insurance, the right to the highest attainable standard of physical and mental health are to be progressively realised and to the maximum extent of Britain’s available resources. Collective rights are also set out such as the right to join a union so that one’s interests are represented. These internationally agreed human rights sit uncomfortably with the British Government’s austerity strategy. The political gain in marginalising an asset and making it a liability is that the Westminster government can use its power to promote an ideology rather than being constrained in practice by international human rights standards. Ensuring human rights principles and standards are respected and promoted in the design, delivery and funding of public services will re-balance power between people and government, and deliver a more just and fair society. People can assert their rights and the government, via public sector agencies, has a duty to proactively deliver those. Unsurprisingly, politicians have invested so much effort into convincing us that human rights are the problem rather than the solution to the injustices that face too many people in our rich nation. The Labour Government was guilty of this tactic too and was criticised by MPs, as far back as 2010, for not delivering on the very Act it introduced in 1998: ‘The Government is, of course, to be commended for introducing the Human Rights Act; but too often subsequently there has been a lack of leadership to use the Act to its full potential, ensure that public bodies promote human rights as well as do the minimum necessary to comply with the legislation’ (House of Commons House of Lords Joint Committee on Human Rights Paragraph 20, 2010). Now the Conservative Government thinks it can get away with abolishing the Human Rights Act and maybe even withdrawing from the European Convention on Human Rights. Instead of Russia initiating a fracture in compliance with European human rights standards and remedies, it could actually be Britain. How mortifying, but we need to park the emotion and focus upon mounting an effective and inclusive campaign of opposition and therein lies the problem. Domestic human rights activism has been notoriously weak in Scotland and possibly that is part of the political calculation that ultimately there will be no broad coalition of sustained action in support of human rights. A strong campaign needs people and influential organisations who are persuaded of the relevance of human rights to everyday problems. Public support is thin on the ground as British-wide polling by the Equality and Diversity Forum (EDF, http://www.equally-ours.org.uk/) showed those who are pro-human rights make up 22% of the populace; those who are conflicted are 41%, uninterested 11% and anti 26%. The sample size from Scotland, although small, confirms similar views although polling was done before the referendum and the general election. Contradicting the propaganda that human rights are bad as well as persuading people that not only should human rights be equally enjoyed but that they are relevant is a bit of a mountain to climb in a comparatively short time. So we need some big wins and quickly. There needs to be knowledge building and sharing using respected institutions. For example, the UN Committee on Economic, Social and Cultural Rights in 2001 pointed out that poverty is: ‘a global phenomenon experienced in varying degrees by all States … While the common theme underlying poor peoples’ experiences is one of powerlessness, human rights can empower individuals and communities. The challenge is to connect the powerless with the empowering potential of human rights. Although human rights are not a panacea, they can help to equalize the distribution and exercise of power within and between societies’. More recently, the UN recognised that in the global economy there is a role for private companies to adopt a ‘respect, protect and remedy framework on human rights within their sphere of influence’. No longer is it just up to governments to deliver on human rights. The UN Guiding Principles (UNGPs) on business and human rights have influenced the Scottish Government which is in the process of commissioning a baseline survey to develop an action plan on business and human rights so that companies based in Scotland comply domestically and in their work globally. That may prove challenging to the political ideology on austerity in Britain. Working family tax credit is being culled as the Tory Government rolls out delivery of its manifesto promise to cut a further £12bn from the welfare bill. This ‘welfare’ payment is paid to the in-work poor so reductions in tax credits are likely to lead to increased child and family poverty. Such actions are regressive which contradicts international human rights obligations. According to research from Citizens UK, our low pay culture is costing tax payers £11 billion per year. Too many people are in work but poor. Over 5.24m people in Britain, 22% of all employees, are earning less than the Living Wage (http://www.citizensuk.org/taxpayer). The research shows some of the UK’s largest retailers businesses are benefiting a low wage strategy with Tesco paying £519m in tax but receiving £364m in public subsidy for its 209,000 low-paid workers. Ultimately, we need to give effect to the new politics in Scotland and work effectively with likeminded people including sympathetic Conservatives. A cross-party coalition working with unions and civil society in support of the Human Rights Act is possible and tests us to think differently about how to achieve the best results using our public services. Mainstreaming human rights in Scotland will rebalance the power relationships between government and people, and between businesses and workers to make our democracy stronger and poverty a thing of the past. That does not need to be a party political issue.